This film opens July 2010. "Wizard of Oz" redirects here. For the fictional character, see Wizard of Oz (character). The current promotional poster. Scary huh? Yeah. It's gonna get an 18 certificate, I just know it. The Wizard of Oz was a 1944 Public Service Broadcast designed to show the disasterous effects of taking hallucinogenic drugs. Unfortunately, the movie, with its bright colours, vivid songs, and portrayal of dwarfs as "Munchkins", became one of the most popular films ever made, after Shrek 2 and Uncyclopedia: The Movie. In fact, use of hallucinogenic drugs dramatically increased after the film's release, with many students trying to get to Oz. Sadly, all copies of the original film have been lost, and this article is about the 2010 remake, due out in 2010. It will be directed by M. Night Shyamalan and will have a TWIST ENDING!!! For those without comedic tastes, the so-called experts at Wikipedia have an article about The Wizard of Oz (film). In Oz, small people are referred to as Munchkins, and seem pleasant folk, despite the fact that they are racially abused by their tall counterparts, the Wizards and Witches. The Munchkins (including Professor Flitwick among them!) are pleased with Dorothy, because her flying house has crushed an evil witch from the East. (This racism towards Chinese people is a common thread throughout the film). Dorothy, being a tormented child, distraught by the death/disappearance/complete lack of her parents, takes pleasure in laughing at the evil witch's corpse, and promptly nicks her shoes. 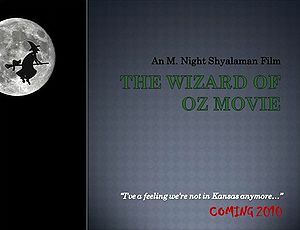 Little does Dorothy know what's coming...unless she's read the script. Which it would be handy if she had, but you know, whatever. Don't want to fuss. However, an evil witch from the West then arrives (played by Meryl Streep, who has developed a taste for musicals since doing Mamma Mia). The witch promptly declares war on Dorothy, believing the shoes to be rightfully hers. Here, she actually has a point, as legally, Dorothy is nothing more than a killer and a thief - though it does depend on whether the Chinese witch made a will. But this is besides the point - in Oz, drug-taking thieves are heroes! Following on from that, Dorothy decides to find the Wizard of Oz, as only he can show her how to get home. To do this, she must follow the Yellow Brick Road, which for the remake, will be a more orange color, for copyright reasons. Along the way, she meets a Lion who is searching for some Meat, to fulfill his daily protein intake, a Scarecrow (convincingly portrayed by a real life scarecrow) who is searching for a Hat, and a Tin Man who is searching for Something He Undoubtedly Already Has. They all sing the world's most annoying song ever, but for the remake it is thankfully being changed to a "We're off To See The Wizard/Toxic Remix" by Britney Spears. After being pursued by flying monkeys, in some erroneous plot point, the foursome decide to sacrifice Toto to the monkeys, so that they can get away safely. This is quite unfortunate for the dog, and is one of the film's most graphic scenes. They eventually reach the Wizard of Oz, who appears to have a fascination with the color green, though this will be blue for the remake. (Again, copyright reasons. Damn lawyers!) The Wizard is then revealed to be nothing more than a fake. Before he has a chance to apologise, however, the Lion eats him, (thus getting his Guideline Daily Amount of Protein), the Scarecrow nicks his Hat, and the Tin Man realizes that what he has been looking for all along, he already has, thus making it a pointless journey and a waste of a week. However, it does tie the story up nicely. The last shot is of a triumphant Toto sitting on a comatose Nancy in a barn in Kansas. The leader of Animal Rights campaign "Eat Humans, Save Animals", almost refused to take part when he read about the ritual sacrificing of Toto. Luckily, M. Night Shyamalan, just like always, had a TWIST ENDING in store, and Mr. Gore was satisfied. Shyamalan (how can that possibly be his real name?) considered getting rid of the Tin Man Who Had What He Was Looking For All Along, as his character is completely useless. In fact, many people say scrap all three of these weirdos, as hitch-hiking no longer has a place in today's modern society. However, Conservatives and other such people demanded they remain. There was also uproar expressed about the Britney Spears inspired soundtrack, apparently more "smooth and seductive." Songs deemed inappropriate included "Ding Dong! The Witch Is Dead" interspersed with "Oops! I Did It Again!" music, and, in the scene where Nancy receives the LSD, "Gimme More". Many fans are disappointed that the director has decided to give it his own feel, and make it "spooky". They are also upset about the TWIST ENDING! Some fans argue that Toto is not supposed to be a killer. 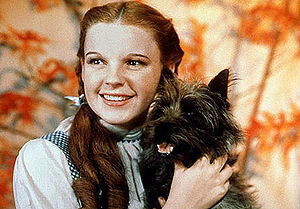 The director responded that he always felt Toto had an "edge" to him, and that there was "something in his eyes". This is still not the most controversial point, however. The thing that has caused more grief than a monkey on a banana plantain, is the fact they renamed Dorothy. (Had you even noticed? Thought not.) According to one Boston member of the "Don't Remake Our Lovely Films Society", that act was "pure evil" and she felt "betrayed." In fact, the D.R.O.L.F. Society have vowed to boycott the film and kill its stars. Many are being arrested for gross misconduct and being taken back to their retirement homes across the country. The Guild of Writers of America's Writer's Strike caused upsets on many television programmes and films, setting back recording for several months. Luckily, it didn't affect this film, as the script was not written by professional writers. Namely, it was written by M. Night Shyamalan. Consequently, Warner Bros is considering setting the release date forward for December 2009, to compete against the lame romantic comedies and boring formulaic horror films. Wow. The production has, however, suffered major setbacks, including the regular appearance of old ladies from the Drolf Society wielding knitting needles and attempting to disrupt the filming of a remake, which they believe is work of the Devil. This page was last edited on 3 September 2012, at 08:48.